We have tomatoes! LOTS of beautiful, juicy lovely cherry tomatoes. So many tomatoes I don’t even know what to do with them anymore. Oh and cucumbers. We have those too! Lots of them. So with lots of cucumbers and tomatoes, the first thing that came to mind was a cucumber and tomato salad, but Karol said she wasn’t a fan. So I had to think about what she does like. And what she (and the rest of the family) like are chicken skewers. With a greek marinade, and pita bread and feta cheese. We like Tzatiki sauce also, but the boys can live without that. 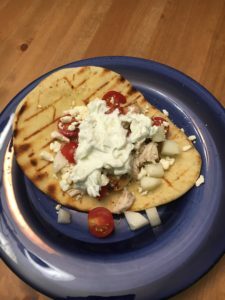 We eat this Greek Chicken and homemade Tzatiki sauce many times in the summer because it is so easy and so Delicious!! So off to the grocery store I went to get some greek yogurt and pita bread. I always make my own Tzatiki because it just tastes better. 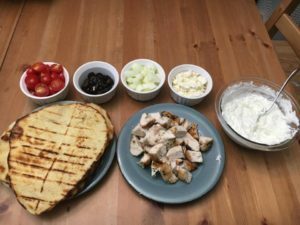 One thing I will say is that it tastes even better the day after you make it then the day you make it so if you can have the presence of mind to prepare (as I didn’t) and make your Tzatiki the day before it will be much yummier. In this case they got what they got. Just kidding, we loved it and we like it even more the next day! 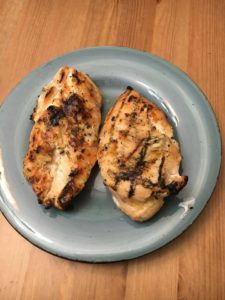 First, you make a simple marinade for the chicken and let it sit in there for as long as you have — sometimes I have 20 minutes and sometimes (although not as often as I would like) for as long as 24 hours. Mostly I just forget to plan ahead. Either way the chicken will taste delicious. Then you make a huge amount of Tzatiki. More than you think you will need, but trust me, it goes fast. 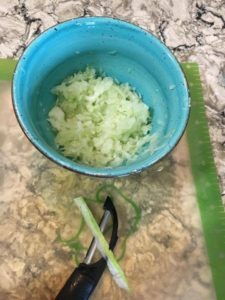 You chop lettuce, cucumbers, tomatoes and red onion (for others than my family I do this, we are not big red onion eaters). Then you grill the chicken. You can either grill your chicken whole or use skewers. For some reason my family just loves food on a skewer. We also always grill the pita bread. Grilling gives it a nice texture and takes away some of the “flour” taste. A super easy way to feed a family or even a large gathering, and you will hardly break a sweat. Added plus of making a light, summer meal that everyone will love and they can take what they want or don’t want, (onions and sauce for my kids, and pita bread for the people not eating gluten) and you can just simply enjoy a lovely glass of whatever your favorite summer beverage is (I like a white sangria personally, or wine spritzer) and enjoy the smell of grilled food and the sound of happy people on a summer evening! 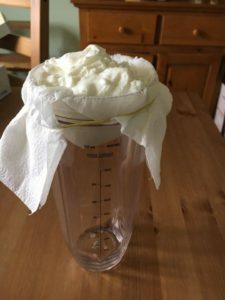 I put my yogurt in paper towels (because I don;t have cheesecloth) and then put in over a large cup (a tall plastic container works also). I wrap a rubber band around it so the liquid will drip through the cloth and your sauce will be thicker. You definitely DON’T have to do this, especially if you use Greek yogurt which has less moisture. I just like my sauce thick. We freeze the chicken with the seasonings on them. Makes dinner prep faster and easier. Ready to assemble. Also, side note I used Naan bread. 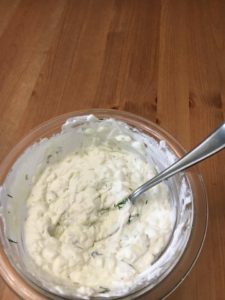 Make tzatziki: Place the yogurt in a medium bowl. Slice your cucumber in half, and remove the seeds. Coarsely grate your cucumber and after sitting for a few minutes, wring it out as well as you can. All of that liquid makes the sauce too wet. Add wrung-out cucumber to yogurt bowl along with lemon juice, sour cream, dill, garlic, salt and pepper and stir to combine. Taste and adjust seasonings. Chill until needed. Prepare salad components: Arrange, onion, tomatoes, black olives and cucumbers on a platter, or in bowls. 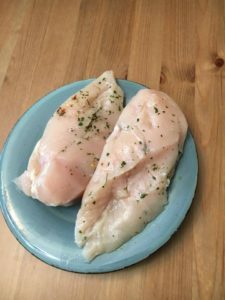 Cut chicken into chunks. Cut pitas into wedges. Add to platter with vegetables and let everyone dig in. This is a great recipe to make ahead of time. Add the marinade to the chicken, package for the freezer and freeze. Thaw in the refrigerator overnight, then grill or bake in the oven. We make this a LOT in the summer. Definitely a family favorite and super easy! !